Historic New England is proud to present Fancy Footwork, an installation of American women’s footwear from the eighteenth to twentieth century from our collections. Starting today see how women’s shoe wear evolved from the pre-Revolutionary times, to Paris-crafted slippers at the turn of the nineteenth century, to footwear inspired by Hollywood. Fancy Footwork is on view at the women’s shoe department on the first level at Bloomingdale’s in Chestnut Hill, Massachusetts, until October 23. Store hours are Monday to Friday, 10:00 a.m. to 9:00 p.m.; Saturday, 10:00 a.m. to 8:00 p.m.; and Sunday, 12:00 to 6:00 p.m.
Shop to make a difference: On Wednesday, October 19, Bloomingdale’s, Chestnut Hill, will donate 10% of your purchases made that day to Historic New England. No coupon or membership is required to participate. Simply bring your receipts to the Historic New England table at Customer Service on the third floor of the women’s store. This promotion only applies to in-store purchases on October 19, 2011, from 10:00 a.m. to 8:00 p.m. Shop while helping Historic New England achieve our mission of preserving our regional heritage. 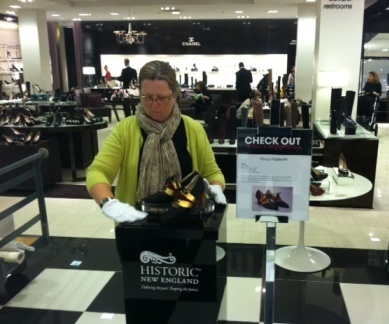 Thank you to Bloomingdale’s for supporting Historic New England. Preview the shoes in the installation.